Royal Enfield found some competition through the entry of UML in India. 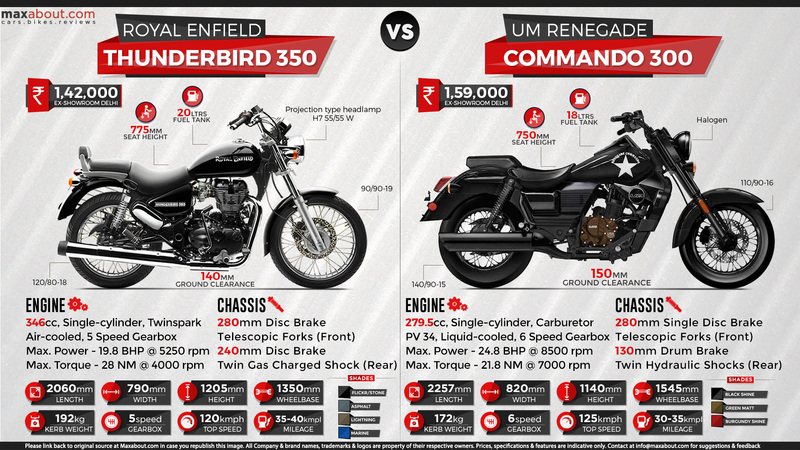 The American classic cruiser range features Renegade Commando in the infographic, compared to the closest RE rival, Thunderbird 350. The Commando comes with a 279.5 cc, liquid cooled and carburetor fed engine, producing 24.8 BHP and 21.8 Nm of torque. Not just that, it comes with a 6-speed gearbox and claims a top speed of 125 kmph. It weighs 172 kg but comes with a smaller displacement engine when compared to the Thunderbird 350, making a clear negative point against the competition. Royal Enfield offers a 346 cc, air cooled engine that is good for 19.8 BHP and 28 Nm of torque. It comes mated to a 5-speed gearbox and comes equipped with premium equipment like rear disc brake and front projector headlight. It weighs more at 192 kg while its top speed is limited to 120 kmph. Thunderbird 350 produces all its power at a relatively low rpm, making it the best bike when considering touring as the first option. It comes with a price tag of INR 1,42,000 while the other one costs INR 1,59,000. Both the bikes offer excellent seat height, favoring even riders with average height and build. Click here to know more about Royal Enfield Thunderbird 350. Click here to know more about UM Renegade Commando 300.